Have you ever been to a Pull & Bear shop? The Spanish brand has got a fantastic range of womenswear and menswear as well as accessorises. For this season Pull & Bear has explored the 20th Century especially the 1960s, 1970s and the 1990s with looks taken form those decades. All white for this ensemble knitted skirt and jumper and the hooded raincoat which really took my fancy when I've seen it at the press day . A cool metallic maxi clutch bag will hold just the indispensable like a tablet and few bits and pieces. Accessorise the outfit with trainers in order to dash from one place to another one in pure comfort. I find this pair of ankle boots absolutely great. 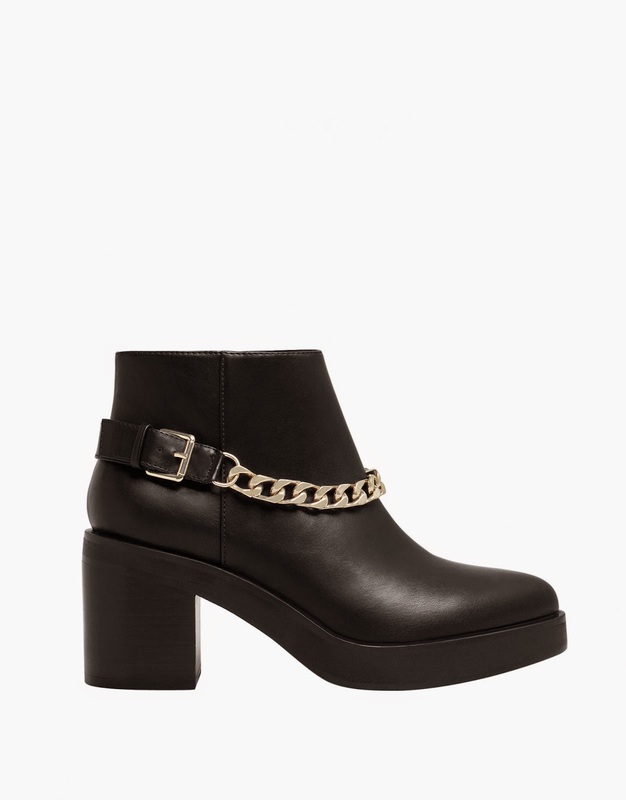 I love the chunky heel and I adore the chain detail at the front. These boots are perfect with anything, skirts, dresses, trousers. You buy a pair of shoes and you are fine for the rest of the season. This denim skirt is lovely, it has a very 1960s vibe but at the same time is very modern. Team it up with flat shoes and a tight jumper for that "Grease" look. I can see wearing the knitted hat with this outfit while ice skating and after that sipping a hot chocolate. I believe that this biker is gorgeous. It is double sided with a faux fur collar, and a pale blue colour that gives a new face to something that would have been the real star in " Top Gun". I am a bit obsessed with biker jackets and this one is the winner. Check the website at www.pullandbear.com to find out where is the nearest store.